the essence of bike trials Trials riding is all about climbing on any kind of obstacles like a mighty goat. Climbing is one of these moves where you are more likely to smash the bike than yourself (especially the crank set). Walls and concrete kerbs are rather unforgiving for the chain-rings (try to practice on wood logs or heavy duty palets). Start easy and build it up. Using the bunny hop approach at any speed (raw street style). Rolling over the obstacle, a smooth quiet move. In one hop sideways, to bring both wheels on the same level. Sideways, with a rear wheel hop, when there is no room for both wheels and it is too high for using the static hop technique. With a rolling pedal kick, for a smooth ascension crossing a gap. (wheel transfer for accurate positioning in time trials). Picking the front wheel onto the obstacle to support a smooth wheel-swap. Hooking the bash plate onto the obstacle, by landing a slow bunny hop or a pedal hop (that way you climb in two steps, but you need a good crank protection). Hooking one pedal onto a wall edge sideways, and pulling up the bike. 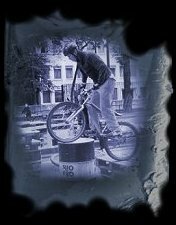 The Wall Ride for a bit of urban fun, or for quick transition on slanted rocks. What pressure for the tyres? It depends on the ground and the sharpness of the edges you climb on. The sharper the edge, the more inflated you want the tyres so that you don't get a double pinch flat when banging the back wheel on it (the unfamous snake bite, rim rails pinching the tube against an edge). For round blunt obstacles like wood logs, less pressure gives extra gripping because the tyre can litteraly grab the edges and shapes. less pressure also gives extra bouncing for landing, and is more comfortable. Fat tyres (2.5" or wider) are the best, and allow a lower pression than thin tyres, so more comfort and more grip.